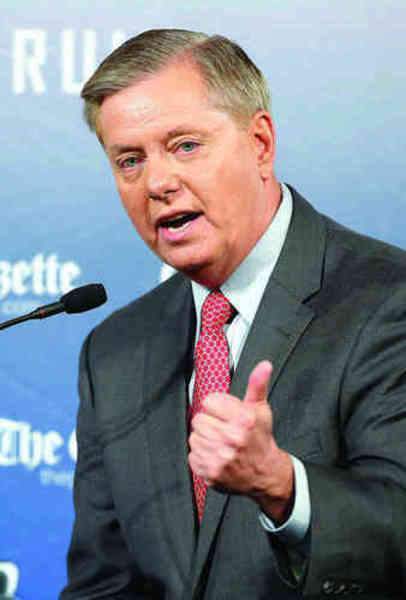 U.S. Sen. Lindsey Graham of South Carolina will be the keynote speaker at the Allen County Republican Party's Bean Dinner on Nov. 1 in Fort Wayne. The annual dinner, which raises money for the local GOP and aims to increase party activism and enthusiasm, is the Thursday before the Nov. 6 general election. “We are extremely fortunate to have someone of Sen. Graham's stature so close to the election,” party Chairman Steve Shine said in a telephone interview. First elected to the Senate in 2002 after spending eight years in the House, Graham ran for president in 2015 but ended his campaign before the 2016 Republican primary elections that resulted in Donald Trump's nomination and eventual election. Graham's Senate term expires in 2020. Shine said Graham is “certainly one of the most visible senators” of either party, displays “a very level-headed approach and common-sense approach to governance” and is “a very good spokesman for the Republican cause.” Graham, who retired from the Air Force Reserves as a colonel, is a member of the Senate Appropriations, Armed Services, Budget and Judiciary committees. Shine said Sen. Todd Young, R-Ind., asked Graham to speak at the Bean Dinner in part to boost the campaigns of Mike Braun and U.S. Rep. Jim Banks. Braun is challenging Sen. Joe Donnelly, D-Ind., in a race that might help determine which party controls the Senate, and Banks is being challenged by Democratic candidate Courtney Tritch in northeast Indiana's 3rd Congressional District. Shine said Banks, Braun and other candidates will attend the dinner, which will be at 7 p.m. at Ramada Plaza Fort Wayne Hotel and Conference Center, 305 E. Washington Center Road. A VIP reception will begin at 5:30 p.m. The Allen County GOP Bean Dinner typically attracts speakers with national profiles. In recent years, dinner speakers have included House Majority Leader Kevin McCarthy of California, Arkansas Sen. Tom Cotton and former House speaker Newt Gingrich. Twenty-two Democratic women – including two from Fort Wayne – have been chosen for Hoosier Women Forward's inaugural class. Launched this year, the leadership program is aimed at preparing and propelling Democratic women into influential roles in the public and private sectors. More than 100 women applied to be part of the first Hoosier Women Forward class, and all applicants demonstrated an interest in public policy, political advocacy and advancing Indiana forward with progressive policies and ideas. Among the class is Fort Wayne business owner Michelle Chambers, a community leader with a master's degree in public administration. Chambers ran for the City Council in 2015. Although she didn't win election, she received the most votes among Democratic council candidates in the primary and general elections. Chambers also won a caucus to finish the city clerk's vacated term in 2015. Another Fort Wayne woman, Stephanie Crandall, was also chosen. She is director of intergovernmental affairs for the city of Fort Wayne. Crandall previously lived in Washington, D.C., and worked for the National League of Cities. She has a bachelor's degree from Ohio Northern University and a law degree from William & Mary Law School. Could Democratic U.S. Sen. Joe Donnelly gain support if he opposes President Donald Trump's Supreme Court nominee? That's the finding in a recent poll highlighted by FiveThirtyEight, a website that focuses on opinion poll analysis, politics, economics and sports blogging. The Trafalgar Group, a polling firm that tends to work with Republican candidates and groups, put out a poll that found Donnelly leading Republican businessman Mike Braun. But the more interesting findings came when Trafalgar Group asked respondents whom they would vote for if Donnelly voted to confirm Supreme Court nominee Brett Kavanaugh. The website points out that Braun's numbers don't change during the question. But many Donnelly voters – probably die-hard Democrats – care a lot. New Haven Mayoral Candidate Steve McMichael has been endorsed by New Haven Mayor Terry McDonald, McMichael's campaign announced. After 20 years as mayor, McDonald announced last year he would not seek another term. McMichael has served on the New Haven City Council since January 2016. He will face Bob Nelson, East Allen County Schools president, in the May Republican Party primary.